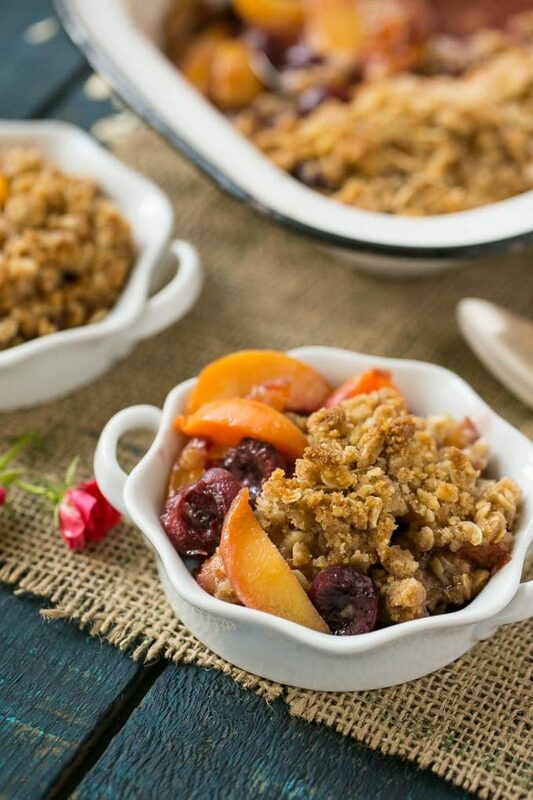 The ultimate fruit crisp featuring summer fruit such as cherries, apricots and peaches, all finished off with a buttery oatmeal walnut topping. The perfect way to showcase summer fruit! 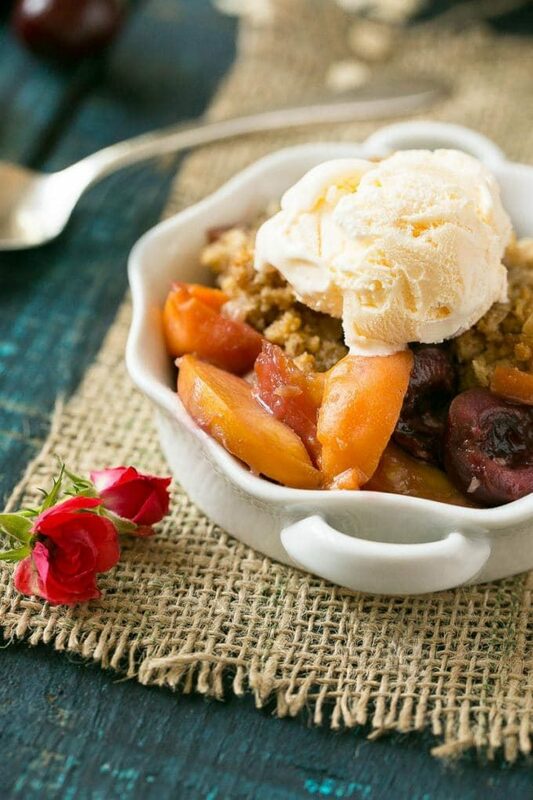 You can never go wrong with a good fruit crisp, especially when stone fruit and berries are plentiful and in season. It took me a long time to find the perfect recipe for fruit crisp. I tried different variations for years and always found something that wasn’t quite right. For such a simple dessert you’d think it would be easy to make a good one, but there are a lot of factors that can go wrong. The fruit filling can be too sweet, too tart, too thick, too thin. The topping can have too much flour, too much oatmeal, too little butter or be overly greasy. 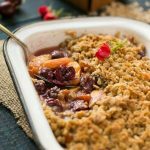 I can, with confidence, tell you that this recipe for mixed summer fruit crisp is the ultimate crisp recipe. To me, this crisp tastes like something you’d pay $8 for in a restaurant. Add a scoop of vanilla ice cream on top and you’ve got the perfect summer dessert. How do you make fruit crisp? For this recipe you’ll need 5 cups of your favorite summer fruit. 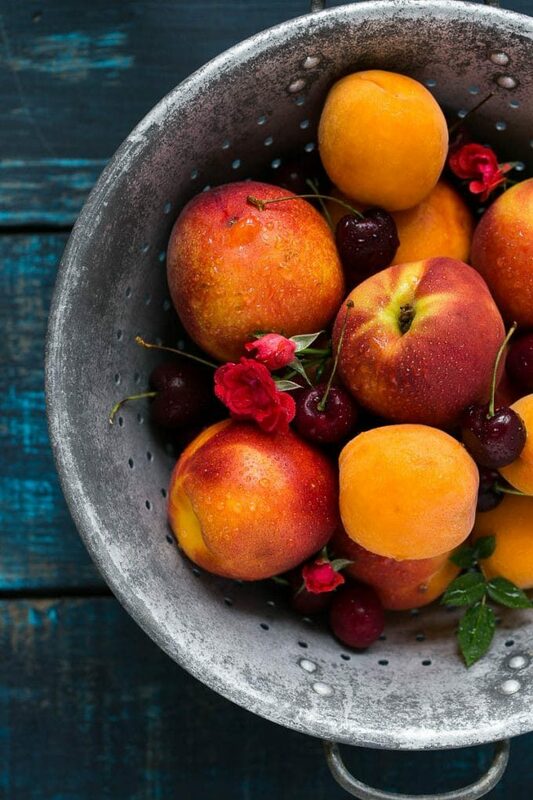 I recommend a mixture of fruit – I used peaches, nectarines, apricots and cherries. The fruit gets tossed in a little sugar and flour and then goes into the baking pan. The crisp topping takes just minutes to put together – the dry ingredients go into a bowl, melted butter is mixed in and then you’re done! I used walnuts in my crisp topping, but you could substitute in pecans or almonds if you prefer. Or if you’re not a nut lover, leave them out entirely. In my opinion, a crisp isn’t a complete dessert until you’ve added a scoop of vanilla ice cream on top – wouldn’t you agree? You probably have everything you need at home right now to make this mixed summer fruit crisp. So what are you waiting for?! The ultimate fruit crisp featuring your favorite summer fruit and a buttery oatmeal walnut topping. Preheat the oven to 350 degrees. Coat a 9 inch square baking pan with cooking spray. In a large bowl, gently mix the fruit with the sugar, flour and vanilla extract; transfer to baking pan. For the topping, put the flour, brown sugar, oats, cinnamon, walnuts and salt into a medium bowl, stir to combine. Pour in the melted butter. Using a fork, stir the ingredients until they are thoroughly combined. Sprinkle the topping evenly over the fruit mixture. Place the pan in the oven and bake for 30-35 minutes until topping is deep golden brown and fruit is bubbling. Cool slightly; serve warm or at room temperature with vanilla ice cream. Make Ahead: The crisp can be made a day in advance; store it in the fridge until you're ready to serve it. Little Helpers: My girls helped make the topping and they sprinkled it over the top of the fruit. Just made this to take to dinner at a friend’s house. It smelled wonderful while baking, and tasted even better! One of our friends has a dairy allergy, so we substituted coconut oil for the butter in the topping. Had to bake it about 10 minutes longer for the topping to really get crispy, but it still turned out amazing. Thank you for the simple, delicious recipe. We’ll absolutely be making this again! So glad to hear you loved it, thanks for reporting back! 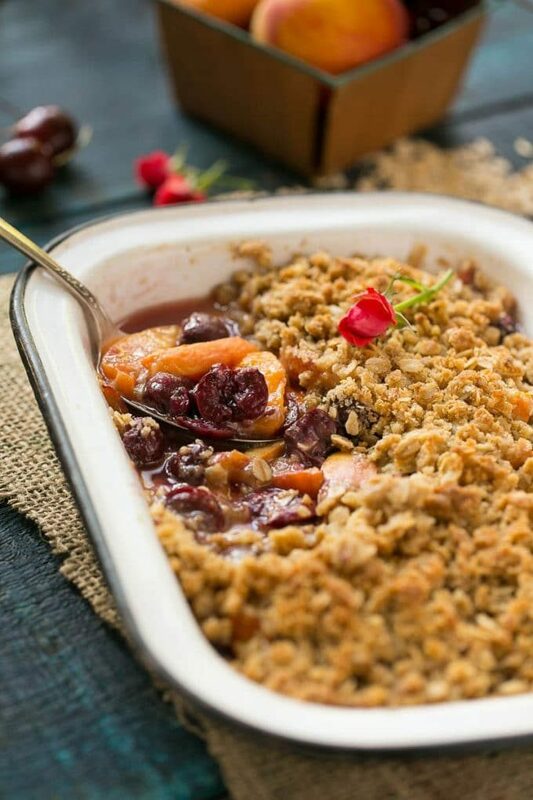 This is the perfect fruit crisp recipe. I threw some blackberries in the crisp. It came out great! Love this! Such a gorgeous post. I love a Summer fruit crisp! There are a few things that I want more this summer than a summer crisp. No idea why I haven’t gotten around to it but that needs to change! And vanilla ice cream…only way! I absolutely LOVE fruit crisps, one of my all time favorite desserts ever! You’re so right, getting this seemingly simple dessert perfect is somewhat of a challenge! Thanks for sharing! Pinning to make very, very soon! Gorgeous photos btw! Thanks for the compliment Gwen, I hope you get a chance to make this soon! This looks so fresh and colorful! Another hit at the zoo! It took me a long time to find a fruit crisp recipe I loved too. This one looks fantastic though – I haven’t made crisp in a long time – need to change that! Summer is the perfect time to make a crisp for dessert! LOVE fruit crisp, especially when its warm and has a big scoop of ice cream on top! This sounds incredible and love that you mixed a bunch of different summer fruits for a little variety! Thanks Krista, the mixture of fruit adds great flavor and texture! Mmmmm so good & mixed fruit is perfect for this time of year! Love your pictures as well! They look amazing & appetizing! 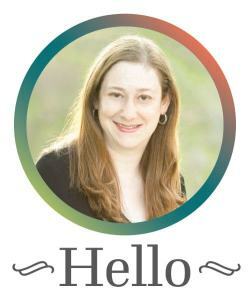 Sara, I prefer a fruit crisp with a mix of stone fruits and your photos make me want to goggle up the whole pan. Delicious! This is lovely – I really like the fruit combination. Such a great summer dessert! Thanks Kathryn, it really is the perfect summer dessert! Fruit crisps are one of my very favorite desserts! This looks so good! 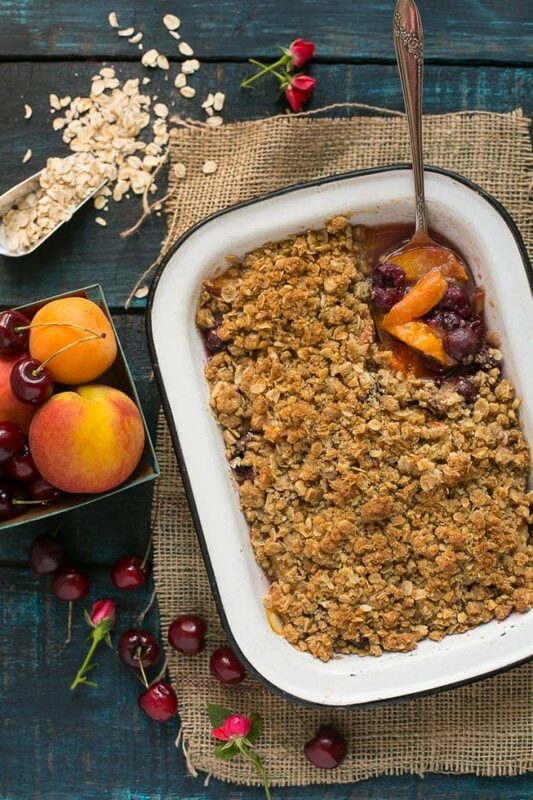 Fruit crisp is such a perfect summer dessert–yours looks gorgeous! Dear Sarah – This is by far the prettiest fruit crisp I’ve ever seen. Would love to make this for my family! Perfect with that scoop of vanilla ice-cream ! Fruit crisps are my favorite in the summer. They remind me of my childhood. The crispy topping is by far my favorite! Thanks Julia, the topping is my favorite part too!